Manchester , UK, 2014-6-20 — /EPR Food & Beverage News/ — “The Show” organised by the country’s leading distributor of catering equipment, Lockhart Catering Equipment, is arriving in Manchester on Wednesday 25th June for its first event outside of London. 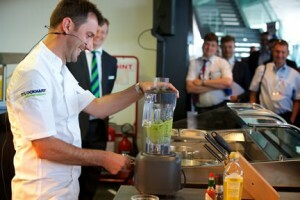 In its fifth successful year “The Show” can proudly call itself one of the UK’s most comprehensive and innovative catering shows, and has attracted industry experts including mixologist James Trevillion from Bonzer and TV chef and food consultant Andy Bates from Brazilian Street Feasts to its first northern event. Having been well received with customers and suppliers alike, the event will offer up its winning recipe of demonstrations, the unique opportunity to see new product ranges before anyone else and the chance to network with over 30 leading suppliers. The innovation zone is a must visit for any industry professional who likes to stay one step ahead of innovative tools where there will be the chance to see the latest equipment in action, and not to be missed tasting sessions. Delegates will also be offered a tour of the world famous football stadium. “The Show” will return to Wembley later in the year, with dates to be announced in the coming months. Attendance is by pre-registration only, so to reserve your place or if you have any queries, email the.shownorth@bunzl.co.uk, call 03701 678678 or register directly here. Exhibitors and customers network at last year’s show. Lockhart’s representative mixing things up at last year’s show at Wembley. Lockhart Catering is country’s leading distributor of catering equipment, supplying the largest range of light and heavy equipment available to the UK caterer. Lockhart is not affiliated to particular manufacturers, allowing them to offer a wide range of options and, more importantly, advise what’s right for specific client requirements.